Vodafone Qatar marked the connection of its first enterprise customer- Gulf Bridge International (GBI) -to its 5G network in Qatar Science and Technology Park. 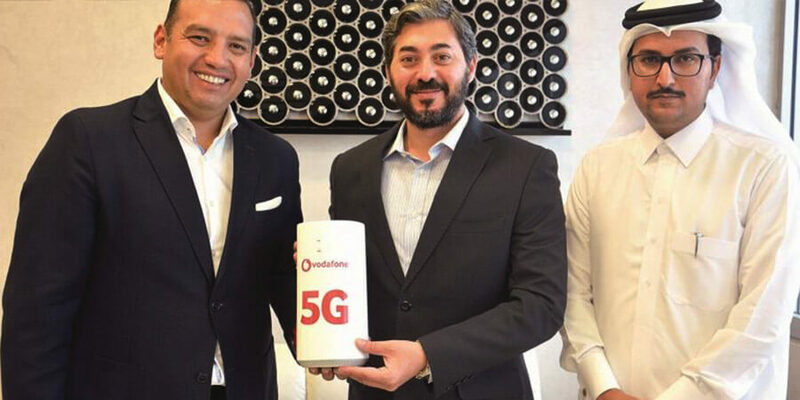 Diego Camberos, Chief Operating Officer at Vodafone Qatar presented a 5G customer premises equipment (CPE) to GBI's management that will provide GBI with broadband access at speeds that exceed 1Gbps with a user experience that's real-time and uninterrupted. 5G connectivity using the CPE, an equipment which is manufactured on a very limited scale worldwide, is available where Vodafone Qatar's 5G network is deployed. This follows the Company's announcement that it switched on its first, live 5G network at an event that demonstrated the transformative potential of 5G, thanks to incredible speeds but more significantly ultra-low latency - meaning a very low delay for data transmission between two points. Diego Camberos, Chief Operating Officer at Vodafone Qatar, said: "We're delighted that GBI is the first company to be trialing our 5G network. GBI is one of our most important partners that has been providing us with international connectivity for many years, so to play a part in further enhancing their operations through our 5G network is something we're very proud of. Leveraging the leading expertise of our international peers, Vodafone Qatar is committed to building a world class digital infrastructure that enhances the quality of lives and helps to drive economic growth and productivity in Qatar." From a business perspective, virtually every industry in Qatar will be impacted by 5G. Businesses across all sectors will be able to monitor their operations in real time. Goods can be produced more efficiently and in a manner more responsive to consumer needs, helping to minimize waste. This will accelerate the country's move towards self-sufficiency - from agriculture to healthcare, and across every sector.